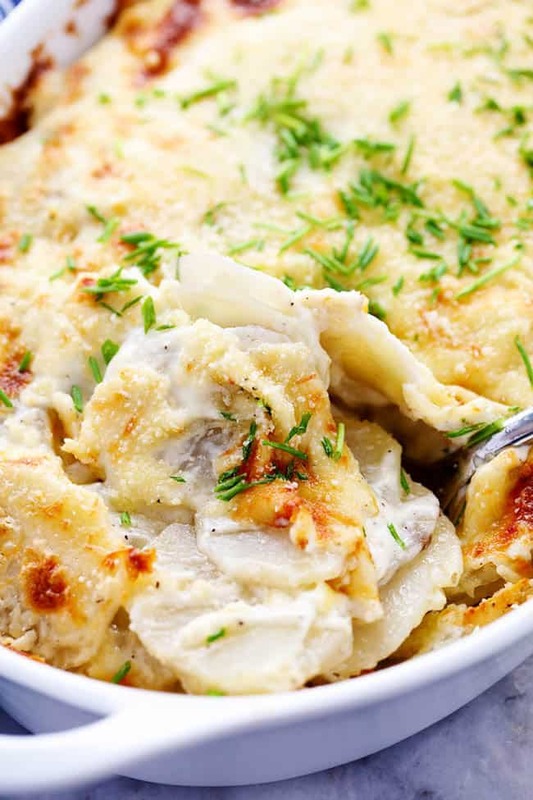 These scalloped potatoes are tender, creamy and so delicious! The parmesan cheese adds such amazing flavor and these are a must make side dish! These make such a great side dish! They go perfect with Classic Honey Glazed Ham, Garlic Butter Prime Rib, or Skillet Salisbury Steak! I love that daylight savings has come and spring is right around the corner! The sun is out longer and it is starting to warm up. Well. It was starting to warm up. And then it snowed. But that is a Utah spring for you. It shows us a little sun and warmth so that we don’t lose our minds and then it snows. Luckily the sun is back out and it is supposed to warm up again and we are going to take full advantage of it! With spring comes Easter and we always look forward to Easter dinner. We love scalloped potatoes at our house and my son requests them every week! I usually make creamy cheddar scalloped potatoes but I decided to change it up a little. These Creamy Parmesan Scalloped Potatoes became an instant favorite! They are SO creamy and delicious. And you are going to love the parmesan cheese inside. They baked to tender potato perfection and the top got this delicious crisp parmesan crust. That was my favorite part! Then you dig in to the creamy, delicious and cheesy layers. Whether you are making these for Easter dinner or any family dinner, you are going to LOVE these as much as we did! 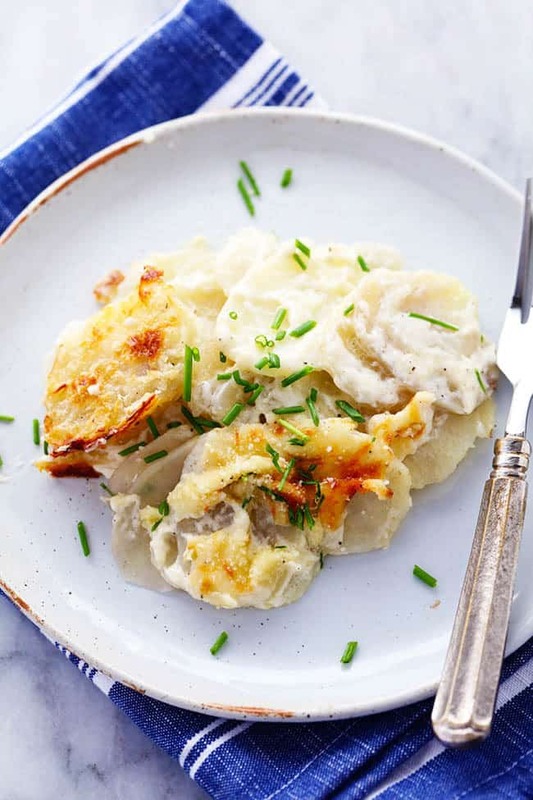 How do you make Scalloped Potatoes? Preheat oven to 325 degrees. Lightly spray a 2 quart casserole dish with cooking spray and set aside. In a small saucepan melt 2 Tablespoons butter over medium heat and which in the flour, salt and pepper. Add the whipping cream and stir for about 2 minutes until it starts to thicken. Add 1/4 cup parmesan cheese. Arrange half of the potatoes in the prepared casserole dish overlapping each other. Spread half of the sauce on top followed by 1/2 cup mozzarella cheese. Repeat with another layer of potatoes and sauce topped with mozzarella cheese and remaining parmesan cheese. Cover with foil and bake for 40 minutes. Uncover and bake for 25-30 minutes more until the potatoes are fork tender and the top is starting to brown. Sprinkle with chives before serving. What kind of potatoes are best for scalloped potatoes? Usually Russet Potatoes or Yukon Golds Russets have the most starch and make the creamiest sauce, but Yukons tend to hold their shape a little better. How thin should I cut the potatoes? 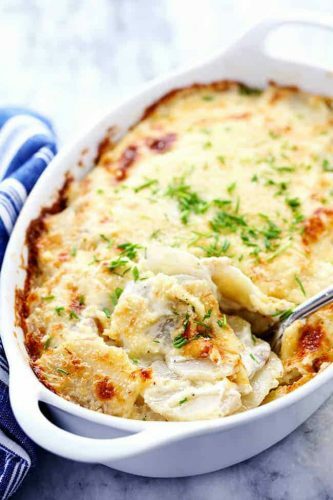 What causes scalloped potatoes to curdle? The curdling is caused by high heat. So to keep the sauce together, you need to make a smooth cheese sauce instead of layering grated cheese and milk or cream with the potatoes. Do scalloped potatoes freeze well? If you plan to freeze the scalloped potatoes, the potatoes need to be removed from the oven before they finish cooking to protect their texture. Once you freeze the potatoes, you may want to thaw them in the refrigerator or bake them frozen. Need even more potato inspired side dishes? Try these! hey girl these look oh yummy! Happy Easter and Happy Spring! These take much longer to bake than the time on the recipe! Next time I will par boil my potatoes before putting in the baking pan to expedite the baking time. At this rate I hope they are done baking before tomorrow(Easter)!!!!!! I am about to make them. Can they be made the morning of the evening they will be served? Yes, that should work great! Enjoy! We made these for Christmas Eve Dinner. We were happy with the flavor for sure, but wow! these took forever to cook in a 350 oven. covered. I would say total bake time with raised temp to 400 degrees was an hour and half. Would make again but definitely par boil potatoes if you want to bake for only 45 minutes! Great recipe! I love that I didn’t need to parboil the potatoes and loved the long cook time on this cold wet day, the smell of the cassarole was what our home needed today. Thank you. Can these scalloped potatoes be cooked in a crock pot? If so, what temperature & for how long? Yes, that sounds great! I would recommend on low 4 to 6 hours. I have not tried it so let me know how you like it!